Is this wooden-handled utensil dishwasher safe? 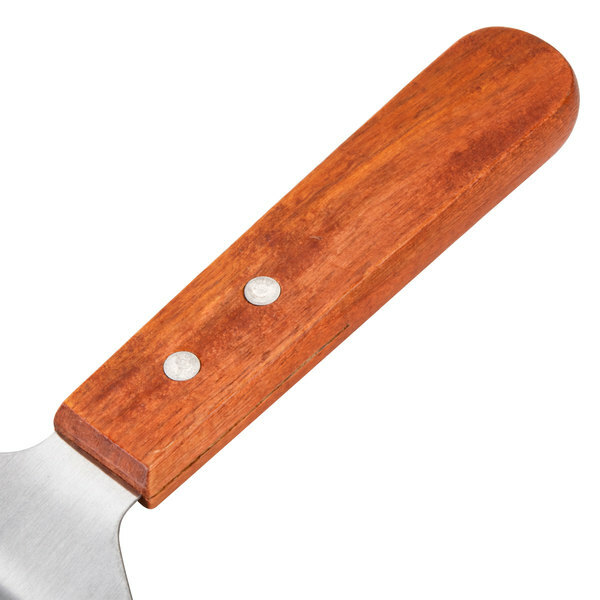 Utensils with wooden handles are not dishwasher safe; exposure to hot water can cause the wood to warp or splinter. These items should be hand washed and dried thoroughly. For optimal results, use a wood conditioner periodically to prolong the life of the wood. 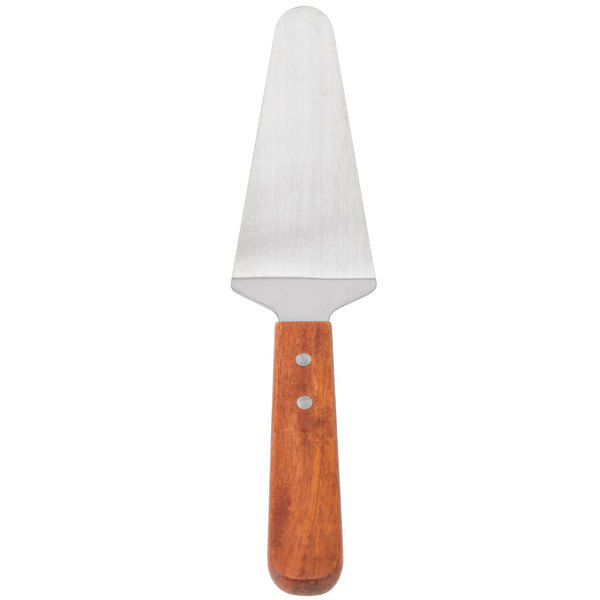 This 5 1/2" pie server is built with quality and durability in mind and features a stainless steel blade to ensure long-lasting serviceability in your catering business, restaurant, or hotel! With brass rivets and a smooth, easy-to-grip wood handle, this pie server will last through many uses and washes. This pie server is a must for all kitchens and bakeries, and useful for serving anything from pizza and lasagna to cake and pie. Regal Cinnamon Sticks - 3 lb. Wilton 2105-4802 Easy-Flex 6 Cup Silicone Muffin Mold - 10" x 7 1/2"
Amazing pie server,with very classic wooden handle that is so strong and does amazing job when serving my cheese cakes and pies. The price and quality is great. Would by more for my kitchen job. I really like this pie server. 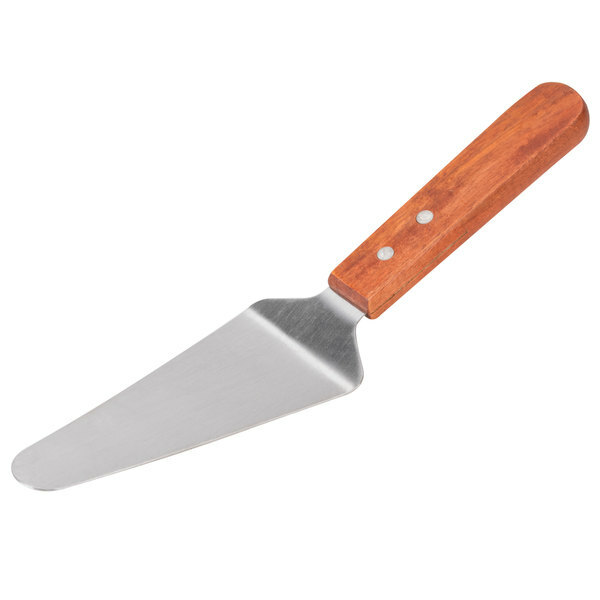 I use it for pizzas, cheesecakes/cakes, and pies but I mostly use it for serving cheesecake. I avoid breaking the crust with this pie server. Great price and prompt shipping. Love that we save a lot of money purchasing through here. The pizza servers are strong and durable. They look nice serving pizza as well. No complaints at all. Highly recommend to purchase! Delivered in only three days! Wow! Have used these servers for years and have been impressed with how well they hold up. They clean easy. Only issue is they tend to get a little loose where the rivets are on the handle. I still keep buying these regularly. This little pie server is a great addition to our kitchen. It has a very solid handle and the metal on the serving part seems durable. 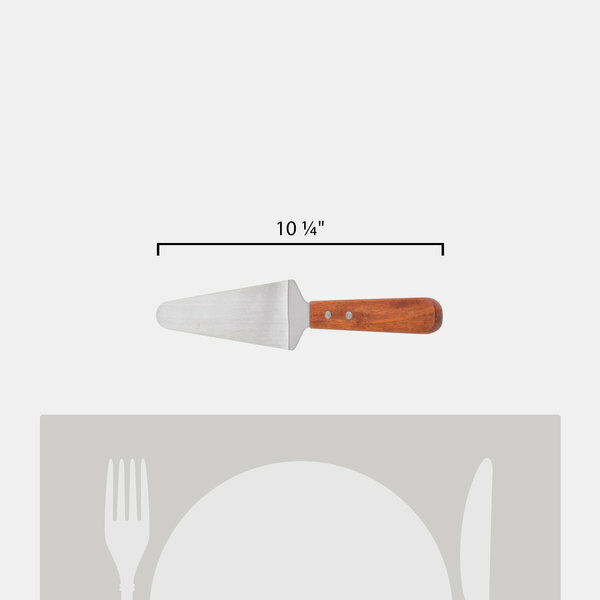 When we are serving any dish that needs a spatula, this server definitely adds a little class. We got these to use with our new pizza ovens. Instead of a tacky hodgepodge of utensils, we now have everything matching and looking great. The pie server with wood handle is not only a terrific low price, it is a great quality and a great addition to our catering business. The servers are well made and we have ten for our pie station and works great for other desserts too. This is great price for a pie server! Love the wood handle. It is very durable and easy to clean. I would recommend especially at this price! Decent budget server. The tang goes up the handle about half way and is exposed, so I can see that being a problem in the future. But for now and the near future, I dont see there being any problems. This is your basic pie or pizza server. 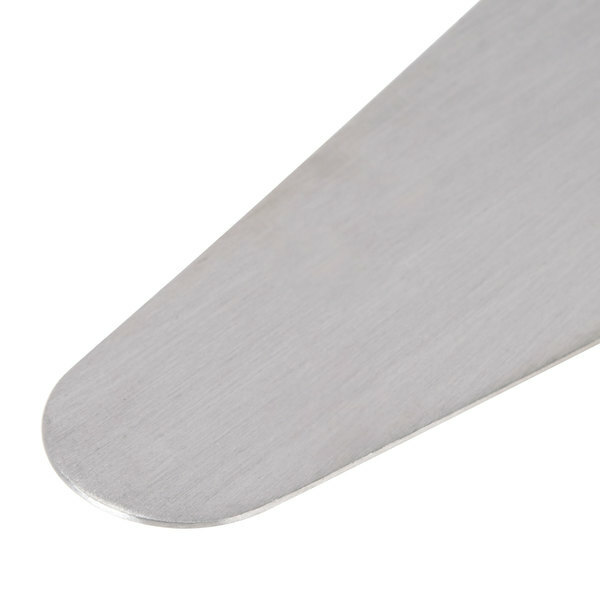 It has a sturdy handle that does not bend with weight or rust. We use this everyday to serve out pizza and they have held up for over a year! Our restaurant uses these servers for pizza and pies. They are the perfect size for both! The handle is very sturdy and they wash really well. this pie server is very sturdy. I like the wood handle, it fits in the hand well. I would recommend to anyone looking for a well made pie server. The pie server works great, the handle is well built and the metal is sturdy. Great size and has a angle to help scoop up the pizza or pie. Perfect for serving pie! It's a little on the small size, so it doesn't really work for pizza or larger cakes, but at it's designed job, it's hard to beat! It's survived a few dozen dishwasher cycles as well. A very cheap priced pie sever that is excellent. 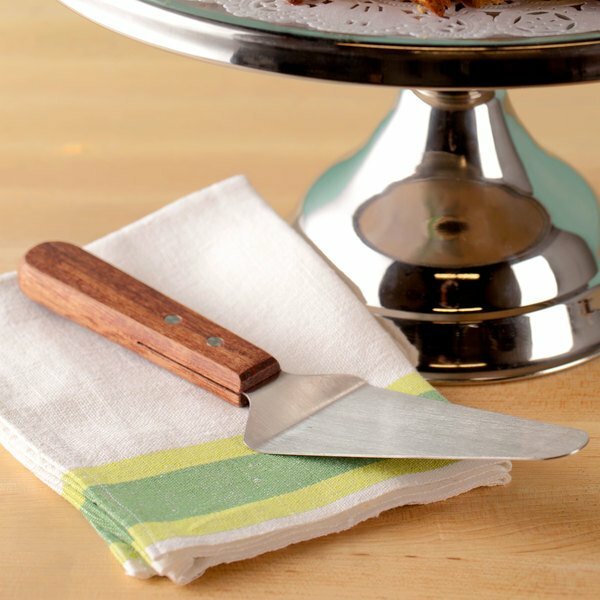 The 5 1/2" server with wood handle is perfect for serving our cheesecake. The server ensure that whole pieces is transported to the plate without breaking.